It takes a little navigating, but Neighborhood—spelled the American way, yes—off Hollywood Road is well worth the effort. 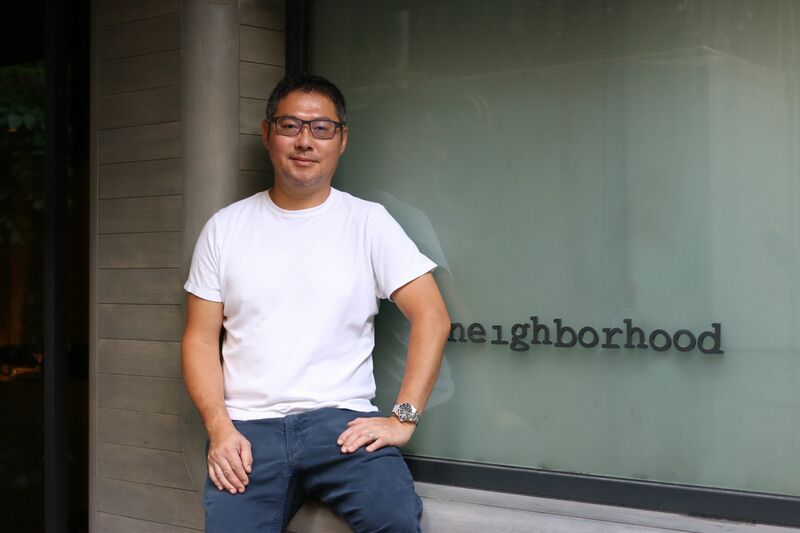 Serving a cuisine of homely French-Italian flavours with a menu that changes weekly, Neighborhood is a labour of love by David Lai, the Hong Kong-born, US-trained chef and restaurateur. The cosy, compact spot, ranked in T.Dining's Top 20 Best Restaurants as well as #32 in this year’s Asia’s 50 Best Restaurants list, was founded in 2014—following culinary stints in San Francisco, then as part of the opening team at Spoon by Alain Ducasse, and running the now-closed On Lot 10 and Kushiyaki Beco, and the now-sold Bistronomique. Later, David also co-founded Fish School with JIA Group. Here though, he takes us out of Neighborhood and into another one he knows equally well. From Stanley Street to Hollywood Road, chef David shows us around Central, with picks beyond the latest openings and into the city’s local fabric. I probably eat at this restaurant more than any other. I always get the beef tendon noodles with soup on the side, a side of gai lan vegetables, and an extra bowl of wonton if I’m super hungry. For me it's quite the perfect meal. There are cheaper wonton noodle places around, but they all tend to use tons of MSG in their soup. This is Hong Kong's original natural wine spot, before natural wines became a thing. It has the largest selection of natural wines – wines with minimal chemical interventions from grape growing to vinification – as well as a small but excellent selection of charcuterie products and cheeses curated by Alleosse, the famous Parisian cheese monger. Roast goose isn't what it used to be because we can only get frozen goose to use in Hong Kong (it makes a huge difference! ), but Yat Lok’s goose is decent enough to do the job. The shop is consistently busy that the goose is always freshly roasted out of the oven so that the meat is still juicy and warm, unlike at other places where they sit at the display window for half a day. For a bit of nostalgia. Where other restaurants are noisy and crowded in the afternoon, it is spacious and quiet here. Their Swiss sauce chicken wings are one of Hong Kong’s greatest culinary inventions. This is one of the few companies that still make soy sauce by hand the traditional way, offering at least half a dozen of varieties of soy sauce alone. There are also other items such as pickles, vinegars, and condiments that are essential to a well-stocked Chinese cooking pantry. This bar is next to my restaurant and it's popular with the 'intelligentsia' crowd. It used to be called Club 64, referencing the 4th June crackdown. Radical political figures such as Leung Kwok-hung 'Long Hair' is a regular here. While full on most nights, the bar is located within Pak Tze Lane Park, so there is plenty of outdoor space at which to enjoy some beer and cigarettes and conversations. A one-chair barber shop that is the domain of Ben, the proprietor. Ben is always cooler than you; he swims in Deep Water Bay every morning, doesn’t use a mobile phone, always has classic fiction around to read while waiting for customers (of whom he has no shortage), and organises some of the best and most interesting jazz sessions every Saturday night. Even though these events are kept secret, there's always a line out the door, as sometimes even famous musicians such as Eugene Pao and Ted Lo play here.